If the 7th month isn’t bone-chilling enough for you, perhaps you should have a look at these photos that will guarantee that you sleep with the lights on tonight. If not, remember this: These images are real. Back then, Photoshop hasn’t existed yet. Still here? Well, here you go, you brave fellow. This photo was taken in 1975 in a church in the United Kingdom when Peter and Diane Berthelot, along with their 12-year-old son, were praying for Diane’s health. It was only when the film was developed that Peter noticed a lady in white old-fashioned clothes and a bonnet sitting directly behind his wife. The church has since been converted into a pub. Katie Adams took this photo of her 3-year-old daughter while she was playing with toys and flipping through some of their unwanted books and magazines in the living room. It is evident that the white, glowing figure of a ‘person’ on all fours is not human. 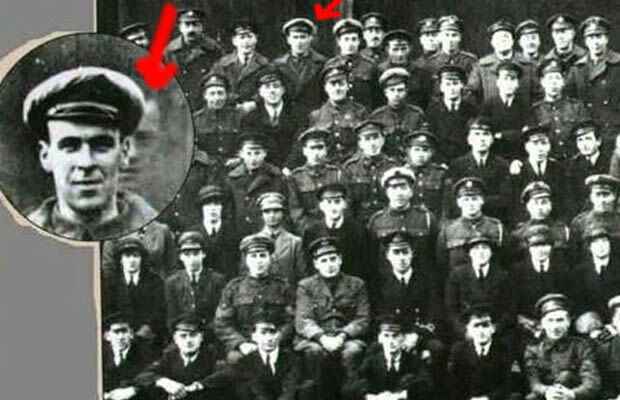 During the World War I, Freddy Jackson was a mechanic for the Royal Air Force and his squadron served the H.M.S. Daedalus. However, in 1919, an airplane propeller hit Jackson and promptly killed him. A few days after his demise, the entire squadron gathered for a group photo. Jackson can be seen hovering behind one of his comrades, grinning and staring straight at the camera. This railroad crossing located at San Antonio, Texas, is an infamous site where many deaths of schoolchildren occurred. Apparently, some daring paranormal investigators visited the area in the dead of the night and snapped some photos, trying to prove the numerous ghost sightings and ended up with this photo. The bag-carrying ghost is believed to be one of the schoolchildren who died crossing the railroad. Mable Chinnery and her husband decided to visit her mother’s grave one afternoon in 1959. Chinnery, who took some photos of the graveyard and her mother’s tombstone before this snapped a photo of her husband in the car. After the photo was developed, Chinnery spotted a bespectacled individual sitting in the backseat who looks remotely like her deceased mother. It is unclear the back story regarding this ghostly encounter but it is obvious that the individual on the utmost right that is grabbing onto one of the women’s arms is not human. Again, in Texas, United States, a photograph of a ghostly apparition of a young girl was taken on a farm. It was said that the farm used to be a crime scene where a serial killer tortured and murdered his victims in cold blood before it was sold off to another farmer. The Bachelor’s Grove Cemetery near Chicago is touted as one of the most haunted places in the whole of the United States. 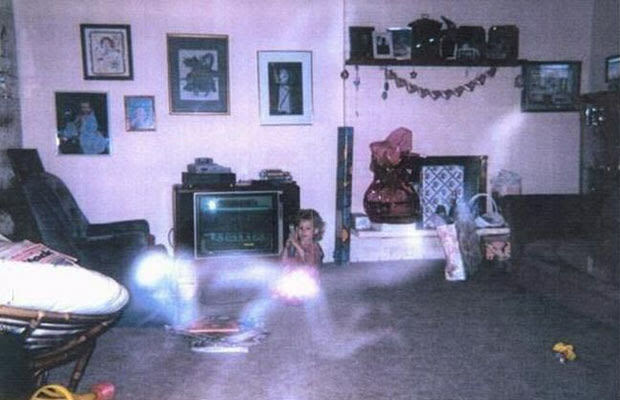 This photo was taken by a group of paranormal investigators called the Ghost Research Society in 1991. Upon closer inspection, one can see that the lady sitting on the bench looks slightly transparent. According to Brad Steiger, a fiction and non-fiction paranormal author, this photo was snapped in a church. 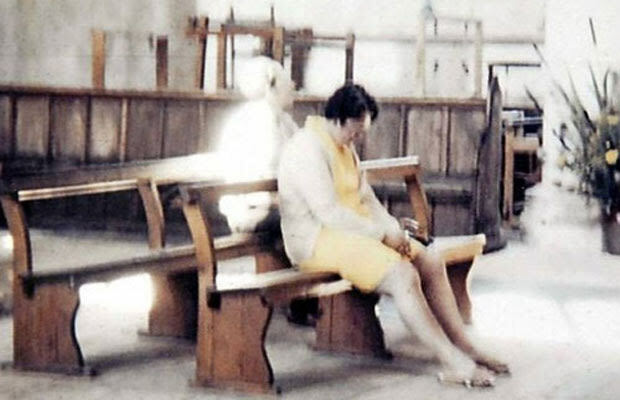 In the book where this photo was found, Steiger writes that there were only two people present in the church – the one who took this photo and his other photographer friend. The apparition seen in this picture was deduced to be one of the late church ministers. Reverend K.F. took this picture of his altar at his church in England. The photo and the negatives were said to have been thoroughly checked by photographic experts for signs of a double exposure and any alterations but nothing was found. The figure was also estimated to be at least 2.7 metres tall.